Alastair Cook's form is a "recipe for resignation" as England captain, says ex-skipper Geoffrey Boycott. Opener Cook made only 16 as England slumped to 57-5 in pursuit of 350 on day four of the second Test against Sri Lanka at Headingley. He has managed 601 runs in his last 24 innings, at an average of 25. "The captain is in terrible form," Boycott said on BBC Test Match Special. "It's a recipe for resignation. I don't know if he will, but it is." "Put simply, England's pacers have been outperformed by a nation of spin bowlers. There was some talk about this Sri Lanka attack being no better than a county side. Maybe a county attack would have bowled better than England on that pitch today. "There was seam, swing and the odd hint of uneven bounce to be had on the fourth day. But, Liam Plunkett aside, a pace quartet that also contains James Anderson, Stuart Broad and Chris Jordan has been way below par." Cook's contribution still took him past fellow opener Boycott on the list of England's leading all-time run scorers. The 29-year-old left-hander is now fifth on 8,125 runs from 187 innings, compared with Boycott's 8,114 from 193. Graham Gooch heads the rankings with 8,900 runs, ahead of Alec Stewart (8,463) and David Gower (8,231). England look set to a lose a Test series at home to Sri Lanka for the first time, in their first series since the 5-0 Ashes whitewash in Australia last winter. "We thought the nightmare of Australia was over, but it is still here," Boycott added. "I don't know where this side can go." Cook also came in for criticism for the tactics that allowed Sri Lanka, who began the day on 214-4, to post 457 and leave England chasing a record highest fourth-innings target. Sri Lanka captain Angelo Mathews made 160, sharing an eighth-wicket stand of 149 with Rangana Herath, as England repeatedly looked to give Mathews the single that would keep him from the strike, despite the visiting skipper's refusal to take it. 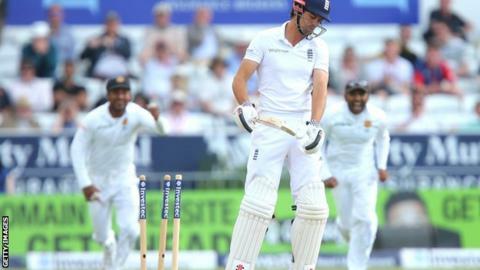 Cook was the first England wicket to fall as seamer Dhammika Prasad ran through the top order with a spell of 4-15. "The concern with England's new-look batting line-up is the captain is not in good nick, we've lost Jonathan Trott and we've lost Kevin Pietersen," said former opener Boycott, who played 108 Tests for England. If England do not win, it will be their eighth successive Test without victory - their longest winless run since 1996-97. "He could resign, Cook. He might if we lose. He's not happy in the job." England batsman Ian Bell said he does not think Cook will quit. "He's got more hundreds than anyone for England and he's one of the best players I've ever played with," said Bell. "I'm not worried about his batting, but, as a team, we have to get behind him." Bell has been suggested as a possible replacement for Cook and has captained the side when Cook has been off the field in this series. But former England spinner Graeme Swann told TMS: "Of the current crop of players, Cook is the right man. "I don't think Bell is the right man. I don't think the extra pressure would do him any good. Cook is more of a leader."